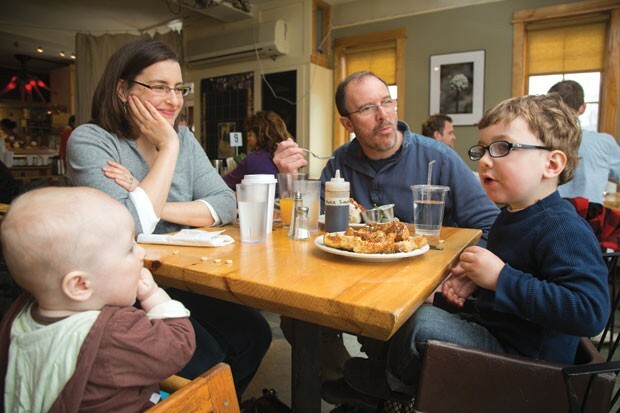 Restaurant Review: On the Rise Bakery | Out to Eat | Kids VT - small people, big ideas! I jumped on the gluten-free bandwagon for Lent this year. By day three, I was dreaming of baguettes and fantasizing about spaghetti. This fast couldn't end soon enough. When my sentence was up, I took my two kids — both sick of hearing me complain about my GF life — to On the Rise Bakery in Richmond for breakfast. I planned to order something freshly baked and decadent. Maybe a cinnamon roll or a muffin. Maybe both. On the Rise occupies the first floor of a red, two-story farmhouse overlooking the Richmond Bridge and the Volunteers Green playground. You order at the register, pour your own coffee and bus your own table. The only wait here is for food, and antsy kids can pass the time digging in the restaurant's outdoor sandbox, checking out the vegetable garden or running around the playground. The dining area is an open and attractive room with a dozen tables and local art on the walls. In warm months, there's additional seating on the patio. We chose a table with a view of the bridge, and I sipped a delicious dark roast from the Vermont Coffee Company. The menu is locavore and totally vegetarian, with some creative spins on traditional breakfast fare, such as biscuits and "sausage" gravy made with mushrooms. It also includes a number of gluten-free and vegan options; the same is true of the brunch, lunch and dinner menus. Seitan sausage sounded unappealing to my son — his actual word was "disgusting" — so he ordered the Ol' Standby: two scrambled eggs, home fries and fresh-baked Portuguese white toast. My daughter got the Kids Ol' Standby, which consists of one egg and home fries. She substituted a house-made onion bagel with cream cheese for the toast. Making up for weeks of wheat-free breakfasts, I ordered a Very Berry Muffin with a pancake chaser fresh off the griddle. Our beautifully plated meals arrived before I was through with my first cup of coffee. The scrambled eggs were bright yellow and steaming; the potatoes golden brown and flecked with paprika. The breads were toasted perfectly — crunchy but without a single burn mark. The potatoes needed ketchup, but otherwise the meals were a hit. My daughter's onion bagel was so good she asked for a second. My muffin was substantial, though not overly sweet or rich. The flavor came from the fruit that had melted into the batter and the light sprinkling of streusel on top. It was fresh and good, but nothing compared to my second course. This was the pancake I had been dreaming of for the last 38 days — a plate-sized disk, evenly browned, neither too spongy nor too cakey, and dusted with powdered sugar. The pancake was so good on its own that I skipped the butter, whipped cream and local maple syrup. I topped each bite only with a smear of organic strawberry spread that perfectly balanced sweet and tart. I ate every bite. Never even considered sharing it with my kids. Stuffed but still suffering from wheat withdrawal, I purchased a number of pastries to take home, including mini cinnamon rolls, maple cupcakes and something called Profanity Bread — glazed pastry dough filled with peanut butter and bananas. If we hadn't had things to do, I would have stayed for lunch, too. The crust on the wood-fired pizza looked and smelled amazing.